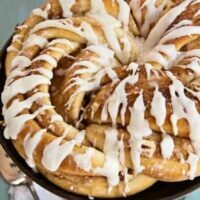 Twisted Cinnamon-Pecan Breakfast Yeast Bread is a yeast bread in the same family as cinnamon rolls–directions for mixing and kneading in a bread machine included. Feel free to use a stand mixer or mix by hand if you prefer. My sister and I plan to open a bed and breakfast when we’re both widows some day. (Please don’t discuss this idea with my husband. It makes him nervous.) This sweet yeast bread will definitely be on the menu. 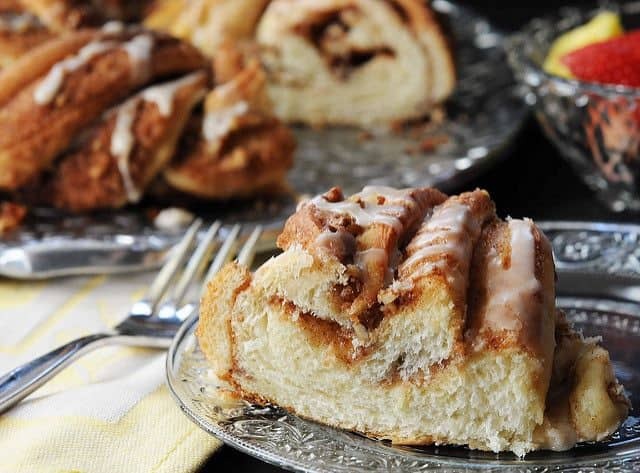 Think sophisticated cinnamon roll with melt-in-your mouth tenderness. The twisted configuration ups the fanciness quotient considerably. Just like 95% of the yeast bread I make, this recipe is mixed, kneaded and proofed in a bread machine but using a big electric mixer or mixing by hand is fine if you’re so inclined. Once the dough rises to double its original size, remove from the pan, shape, allow to rise again and bake. 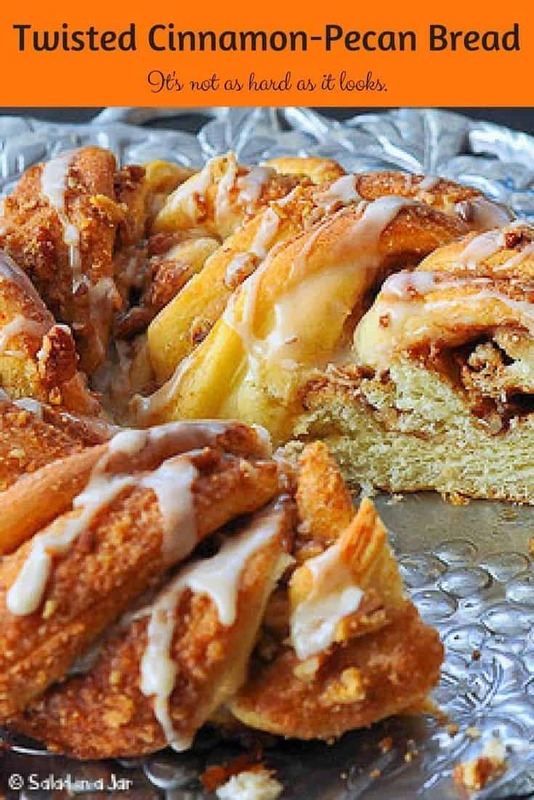 Now it gets a little tricky but the twist is what makes this sweet bread special. Proceed with confidence. Don’t be scared off by the shaping instructions. I’ve made many less than perfect twists in the past but they still tasted incredible–as in calling my name from the kitchen the rest of the day. The glaze will cover a multitude of sins. 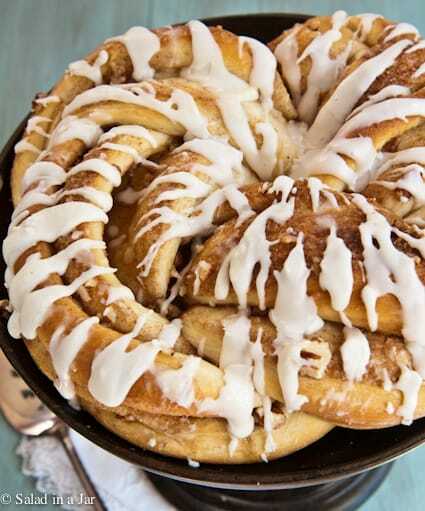 I normally use more icing than pictured here but I wanted you to be able to see the twist. Place all ingredients in order listed into bread machine pan. Set on dough cycle. After 5-10 minutes and check dough for consistency. Add flour 1 tablespoon at a time if too wet or water 1 teaspoon at a time if too dry. When dough has risen to double, remove from bread machine and divide in half. Cover each portion with plastic wrap and let rest 10 minutes. Roll first half into a 9 x 20-inch rectangle. Spread with half the butter. Sprinkle with half of filling mixture. Starting at long side, roll up jellyroll style. Pinch seam to seal. Slice roll in half lengthwise. Place halves side by side, with cut surfaces facing up. Moisten one end of each portion with wet fingers. Push the ends together to join the two pieces of dough. Twist pieces together; shape into a ring and fit into a greased 8 or 9-inch pan. Moisten ends and press to seal. 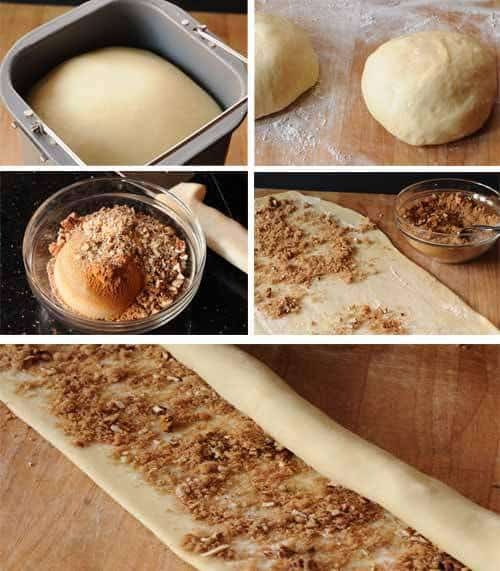 Repeat process with other half of dough and filling. Cover and let rise in warm place until almost doubled in size. Preheat oven to 350 degrees F.
Bake for about 25 minutes, or until golden brown. Let stand 3 minutes and transfer to serving platter with spatula. Such a pretty way to shape it. Thanks for the great tutorial and recipe. Thanks for your reply, I wanted to tell you that before I found your site I was not using my bread machine now I love it, your yogurt making way is awesome too but I can not bring myself yet to buy that strainer, hopefully in the future. Thanks for all your recipes and tutorials! Looks very very yummy and I want some but do you think I could make it as a loaf? Is there any way to make the dough the night before and then bake in the morning? Could the 2nd rise be done in the refrigerator? Yes, you can make the dough and then shape it. I would refrigerate at that point. In the morning, Remove from fridge and allow about 60-90 minutes to rise until not quite double and bake as usual. Hope it turns out great for you. I’m glad to see the extra tips. I’ve made this recipe twice…both times amazingly good! ! Both times though when i cut into my jelly roll it opens up right away not leaving the nice, neatly layered look yours has. I felt like I didn’t have control of the final outcome. Is my dough over proofed? Roll not tight enough? Ideas and tricks welcome! I adore this bread! !! Just made this recipe last night! It is AMAZING!!! My husband and family are ravenous for more! 🙂 Thank you for sharing!! I love the videos you make. Wish you would have had one for this receipe too. Loving all your ideas and help! Oh, delicious and beautiful! I think I just might give this a try for Christmas morning or some time during the Christmas season. I do have a breadmaker, and LOVE it, but have not yet moved beyond letting it bake my french bread for me (which we do at least twice a week). that pic before the second rise makes me jealous. you cant even see the ends of the bread where it was joined to form a circle. looks just perfect. I can’t wait to try this. 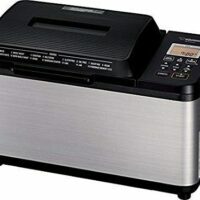 I just got a brand new in the box Toastmaster Bread Box (bread machine) at a garage sale for $19.50. Two days in a row I made an incredibly good Pizza stromboli by doing the dough in the bread machine. I’m going to make your recipe Sunday or Monday. Thank you. “Romaine”–I must say this recipe looks like a true winner!! Just let me know when that B&B opens–I’ll be there with bells on! Need another partner?? Thanks for all the wonderful recipes you always have. Can’t wait to try the Fish Pizza! I am a newbie to your site – and I *love* it already! Thus far, I have attempted your Monkey Bread recipe & this Twisty Bread. Both were fantastic, and big hits with my family! The only “hints” I would give someone trying this recipe out for the first time would be to make sure your rectangle is LONG. I thought I had mine long enough, yet when I was finished twisting it, I could hardly wrap it into a circle without it becoming one large mass of messy dough (delicious messy dough!). My second attempt included a longer rectangle of dough, plus – while I was rolling the dough up, jelly-roll style – I was softly pressing the dough roll, making sure it was a nice, tight roll. I didn’t do that with the first roll and ended up with a kinda loose, messy roll. Great tips. 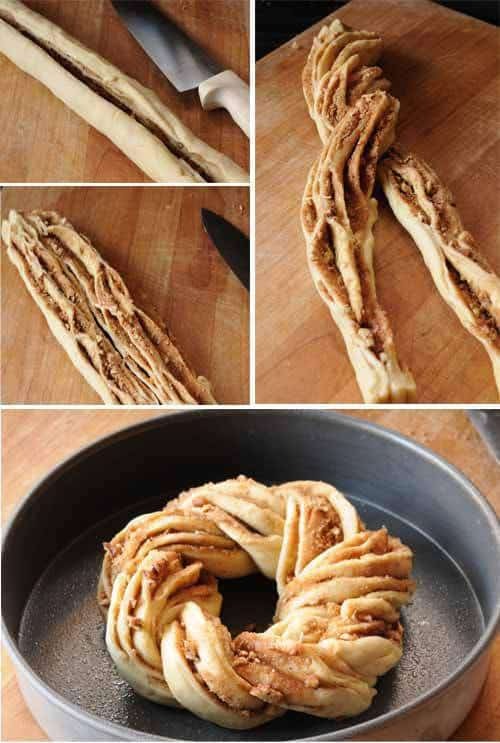 I have been making the twisted cinnamon bread for so long, I had forgotten my struggles to form it right in the beginning. Thank-you for commenting about it. Jenn, I suspect you aren’t rolling tight enough. HOWEVER, they do fall apart somewhat for me too. I just push them together. The braiding process helps hold them. Thanks Paula! I was nervous handling the dough too much would make it less fluffy and soft in the end. I will get a little more business-like about it the next time. Also, I’m embarrassed to admit I never understood this was supposed to be two separate rings? I always twisted all four ropes together to make one ring. 🙂 The last sentence kinda explains why it was hard to hold together. Glad you wrote back. If I may make an additional suggestion that works for another yeast recipe I make with a tricky shape and filling….I make the dough the night before and let it rise in the refrigerator overnight. Working with chilled dough is much easier to roll out, and the finished product always looks more perfectly shaped for me…. Of course, the second rising will be slower with cold dough, but might be worth trying. I made this over the weekend. It was fantastic! Thanks for all the good recipes! I have a Toastmaster bread maker that my Grandma gave me. It’s a few years old, but it’s been working great. 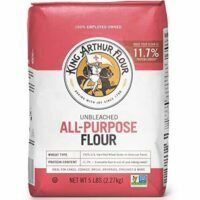 Sometimes I add King Arthur White Wheat flour, since it’s not as noticable, but it’s just never as good. I’ll have to keep trying! This looks amazing. I think I may try it for breakfast Saturday morning. Do you have any good recipes for whole wheat bread using the bread machine? Any recipes that I’ve tried are never very good and Allen won’t eat them! Gina, I’ve missed you. Can’t imagine how busy you must be though. Don’t really have a good whole wheat recipe. I’m not that fond of it myself so rarely go there. Occasionally, I will add 1/2 – 1 cup whole wheat to my rolls but that’s about it. Let me know if you come up with a good one. So that’s how the twist is made. Wonderful! This looks beautiful and the instructions are very good. Thanks. This looks amazing! I think I have to try it. This looks AMAZING! I realize more and more after reading your blogs how badly I need a bread machine! If you like homemade bread–you absolutely “knead” one. 🙂 Unless you like to do it all by hand. I can’t relate to those people. What warm place do you put your twists to rise? How long does it take to double in size before baking? Jennee, You answered the question. Alright! I assume you are talking about a warm place for the second rise. Best place for first rise is inside your bread machine. In oven (set at 100 degrees if your oven will allow) with light on. Inside microwave in which you have previously boiled water. Close the door. On top of water heater or dryer if running. In front of heating vent. In middle of a hot Texas summer? back porch. Seriously. Covered of course. How long it takes to double in size is directly related to where you put the bread to rise. I would allow an hour but could be 30 minutes if spot is warm. In winter time in a cold house-could be a little longer. this was a yum, yum, yummy treat on our “Texas Christmas” brunch! Christina, yes, Arthur Court. My daughter-in-law likes to collect and give that stuff. I love it. Mimi, thanks for the creme fraiche directions. This looks super yummy! I will come stay in your bed and breakfast! Is that an Arthur Court platter you put the bread on? I hear that stuff is fantastic! It looks so tasty. I love the detailed instruction. btw creme fraiche is easy to make. Both of these recipes work equally well and the procedure is the same for both, it just depends on what I have in the fridge as to which I make. 2 cup cream and 2 tbs buttermilk or 1 cup cream and 1 cup sour cream. Stir together in a glass jar and let sit at room temp for 8-12 hours, until thick. Refrigerate until cold. Oooh, how cool is that!?! I’ve never seen that done, it’s very impressive. P.S. 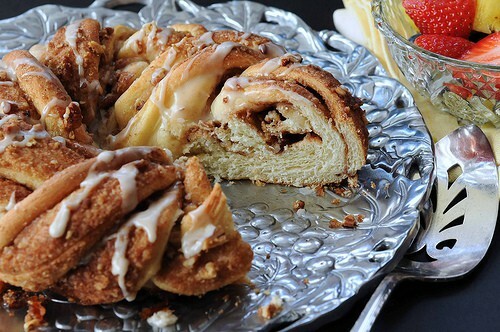 I just made cinnamon rolls this morning. Wish I’d have seen your post first. This recipe looks like a keeper! I bet Kent Matthew would like it better than peas! Drool is dripping on my keyboard. Why do you do this when I am trying hard to lose 5#? My goodness! This is a stunning pastry, I love the technique! That is gorgeous, and I’m sure it’s also delicious! How about opening the bed and breakfast sooner rather than later, and offering cooking classes there too?